Soothing adhesive remover for sensitive skin. Aloe Solve is an advanced solvent specifically designed to remove adhesives. Soothing adhesive remover for sensitive skin. 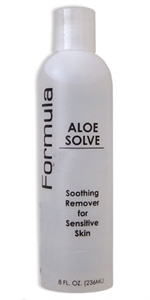 Aloe Solve is an advanced solvent specifically designed to remove adhesives from sensitive skin. It contains Vitamins D & E, Aloe Vera, silicone and a special blend of botanical extracts that condition and moisturize the skin. Aloe Solve works quickly to remove "Farrell Formula" Cohesion and Ultra-Hesion adhesives without irritating the skin. Aloe Solve is not a dermal irritant per independent lab tests.